LANSING — The battle to be Macomb County’s public works commissioner — a job that will pay $130,034 in 2017 — cost at least $3.3 million, according to campaign finance records. The cost of the race between long-time Public Works Commissioner Anthony Marrocco, a Democrat, and U.S. Rep. Candice Miller, a Republican, was 25 times the position’s pay. Miller ended up winning the contest by 36,728 votes, according to the official results. Miller got 54.6 percent of the vote while Marrocco got 45.4 percent. Miller is currently a member of the U.S. House, having served there for 14 years. In the March announcement of her campaign for public works commissioner, she said it was “time to come home” to Michigan. Miller previously served eight years as Michigan’s secretary of state. Marrocco was running for a seventh term as Macomb County’s public works commissioner, having served in the job for 24 years. The public works commissioner is in charge of storm water management, drinking water and sanitary systems. 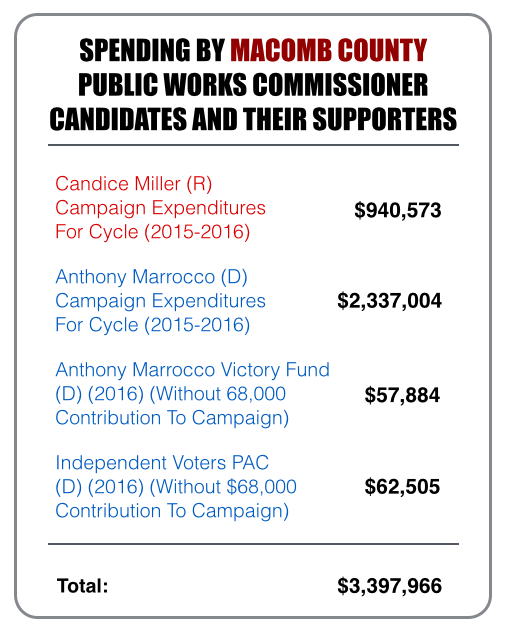 In Marrocco's race against Miller, Marrocco had money on his side. His campaign committee reported raising $2.176 million during the election cycle including $1.4 million in loans from Marrocco. The committee reported spending a total of $2.337 million. Of that amount, $1.412 million was spent on what’s described in disclosures as “advertising.” His campaign ran numerous broadcast TV advertisements in the Detroit market. In addition to his campaign fundraising, two political action committees (PACs) tied to Marrocco also tried to influence the race. The Marrocco Victory Fund and the Independent Voters PAC, which share the same treasurer as Marrocco’s campaign committee, both gave maximum contributions of $68,000 to Marrocco’s campaign. On top of those maximum contributions, MCFN obtained mail pieces that were sent to Macomb County voters directly from the PACs, according to their disclaimers, touting Marrocco and criticizing Miller. According to the mailers' disclaimers, the PACs and the candidate committee share the same post office box in Mount Clemens. 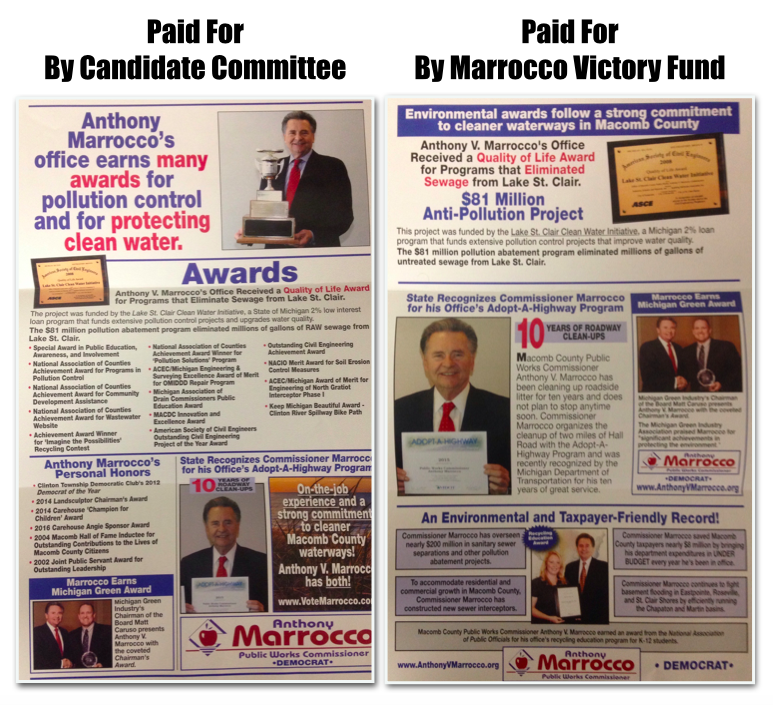 One of the mailers from the Marrocco Victory Fund shared the same language and photographs as one of the mailers from Marrocco’s campaign. The Independent Voters PAC reported spending $62,505 in 2016 as of Oct. 20 — not including the $68,000 contribution to Marrocco’s campaign. Of that amount, the PAC spent $20,906 on postage and “mailing” and $23,942 on printing and advertisements. In order to spend money above contribution limits campaigning for Marrocco, the PACs should have been acting independently of Marrocco’s candidate committee. Committees that are under the control of a candidate are subject to the $68,000 limit in spending in direct support of the candidate's election. In a Oct. 21 letter provided to the Michigan Campaign Finance Network, Marrocco described the PACs as two that “have traditionally supported me.” In the letter, Marrocco said he asked the PACs to donate contributions from Rizzo Environmental Services to charity. Rizzo is a trash contractor entangled in ongoing criminal investigation into Macomb County officials. “I am happy to say they have agreed with my request,” the letter from Marrocco says of the PACs. Marrocco’s campaign didn’t return a request for comment. A spokesman for Miller’s campaign declined to comment. Miller’s campaign reported raising $955,064 during the cycle with $500,000 coming from Miller’s congressional campaign committee. The campaign spent $940,573. 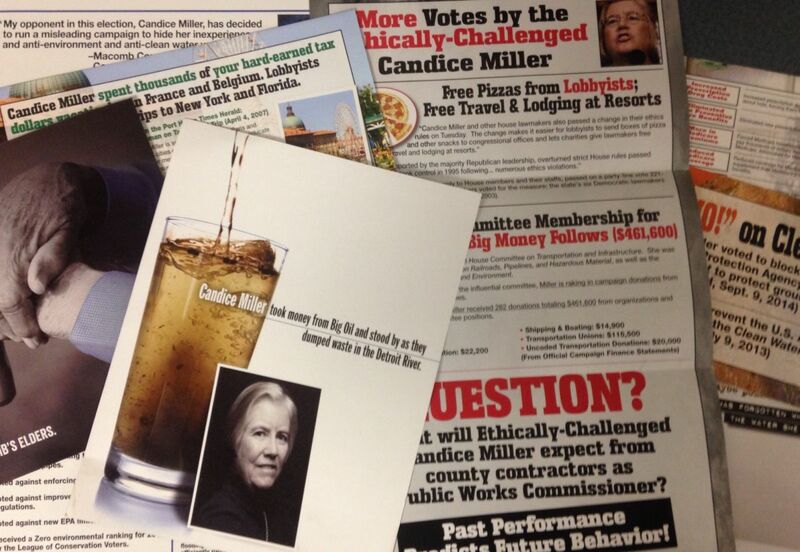 Miller’s campaign reported spending $448,000 on “advertising” and $153,986 on mail and postage. Marrocco’s campaign and the PACs that support him spent more on mail, disclosing $157,389 in spending on “postage” alone. One Macomb County resident reported receiving 12 pro-Marrocco mail pieces. Another resident, Kathy Western, reported receiving 13. Western said she received three pieces a week at some points in the campaign. Marrocco’s strategy reminded Western of the powerhouse races of Macomb County from the 1970s. “His approach seemed very old school,” Western said. The total spending by the candidates and the two PACs was at least $3.3 million, making it one of the most expensive races at the county level in Michigan history. It even beats a 2012 Oakland County circuit court race that saw $2 million in spending by Washington D.C.-based nonprofit organizations. The total spending in that circuit court race was about $2.7 million. The wide majority of the spending was done by the outside groups. Marrocco reported loaning his own campaign $1.4 million during the election cycle. He received $68,000 from the Independent Voters PAC and another $68,000 from the Marrocco Victory Fund. The United Auto Workers Voluntary PAC chipped in $45,000 for Marrocco. Employees of Roseville’s Lanzo Construction gave $23,400. Employees of the Bloomfield Hills-based engineering firm Hubbell, Roth & Clark gave $17,000. Miller’s congressional committee, Candice Miller for Congress, transferred $500,000 to her campaign for public works commissioner — a move that’s allowed under the Michigan Campaign Finance Act in this situation. On top of that, her campaign received $13,600 from Joan and Wayne Webber, of the Webber Group, and $13,600 from Ann and James Nicholson, of PVS Chemicals. Employees of the Rochester-based engineering and surveying firm Spalding DeDecker gave $14,060 to Miller’s campaign. Employees of the Shelby Twp.-based Dan’s Excavating gave $10,113.